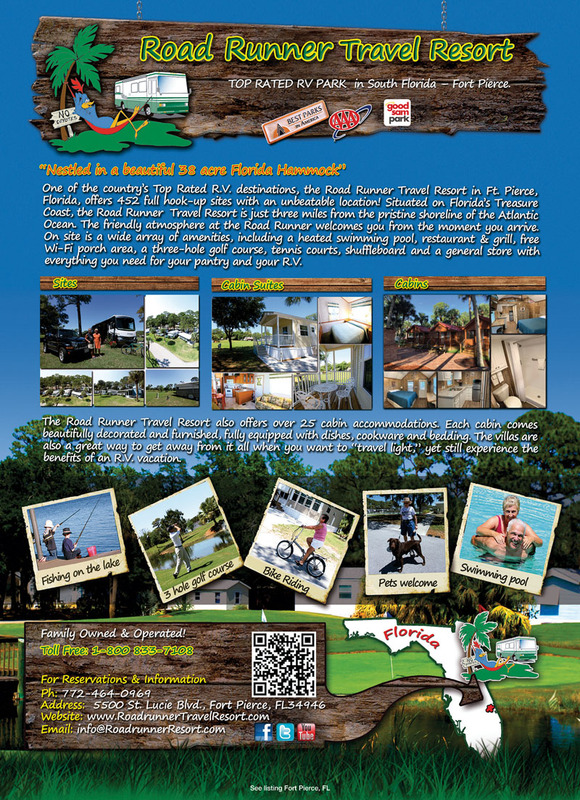 East Coast RV resort nestled in a 38-acre natural Florida Hammock. 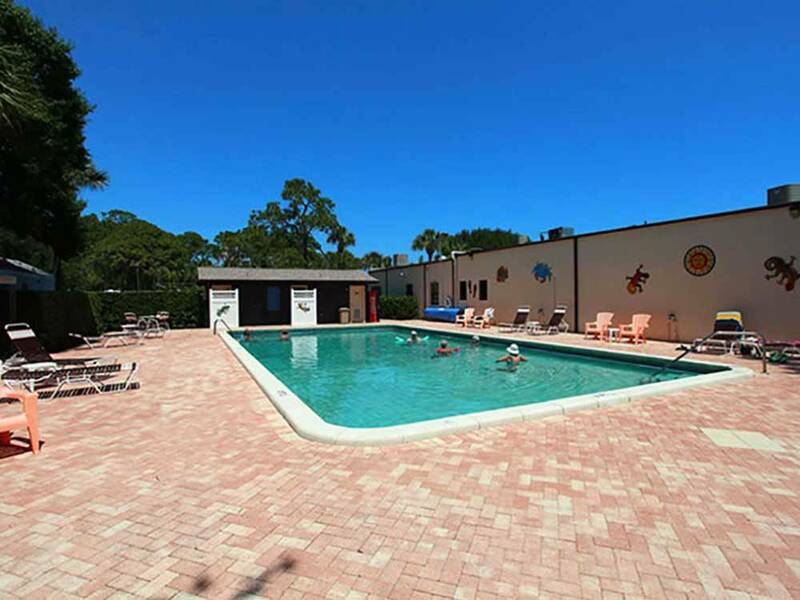 Full-service resort with immaculate facilities, pool, great recreation, restaurant & 3 hole golf course on site. 5 miles from beach & fantastic FL weather. Completely furnished rentals with summer specials. 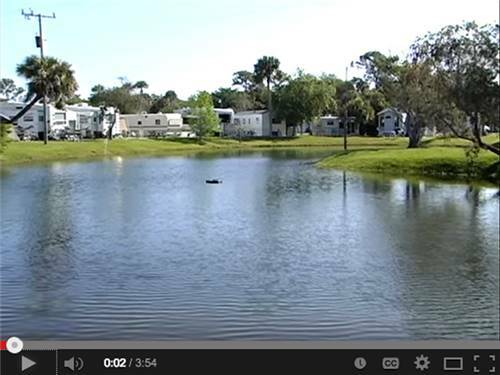 Roadrunner RV Resort is a large campground, located a few miles inland in Fort Pierce. My experience has shown that most RV parks are located adjacent to an active railroad, an Interstate, an airport of a combination of all 3. This one is next door to the busy St Lucie County Airport. Take-offs and landing occur frequently and at all hours. The facility is well managed and the grounds well maintained. The staff does their best with check-ins, tho the office gets busy, especially during snowbird season. Speaking of snowbirds Roadrunner must advertise in Quebec. I'd estimate that, during the winter months, 90% of the park is French speaking Canadian. They literally take over the place and are pretty insular. After mid-April, they flee back north and the campground is quiet and sparsely occupied, mostly with permanent residents. The bathrooms are kept clean, but can get messy in a hurry when the park is full. They have a multi-use room, which hosts meetings and events. There is a small diner on site that serves decent meals. A pitch and put golf course and a well stocked general store. Overall a very nice park, with two very distinct personalities, depending on when you stay. Large mostly wooded sites, full service store, and nice restaurant make this a desirable location for visiting the Fort Pierce area. We did not find an abundance of activities in the park but there is much to do in the area. There were several nights with entertainment at the restaurant/club house area. We were very disappointed with this resort after seeing good reviews. The weather was very rainy so we understand that the grounds would be wet, but there must be a drainage problem. There was standing water behind our rig for the entire stay, and the site was so wet and muddy we never sat outside. When we booked the stay we were told there was no cable but there was wifi. We were also told we could store our RV for one week after our stay while we went on a cruise, and we didn't have to make a formal reservation because there was always room. My husband arrived first and checked in, I arrived shortly after and asked for the wifi code. I was told there was no longer any wifi at the site! We were told we could sit on the porch outside the office for wifi, again the weather was cold and. rainy! They also said there was no room to store our RV even after I explained we had been promised when we booked! Our tv antenna didn't get any major networks, when we asked about it at the office we were told we needed to pay for cable. The staff was not helpful at all. We will not return to this campground. This is a very busy Park, with friendly, helpful staff. Laundry facilities are very good and kept very clean. There is no cable available for less than a month's stay (independent provider). Also, there are lots of trees that cause interference with satellite systems. There are alot of things to do for entertainment. Grass at site was not cut. Could not use TV antenna due to interference. Expensive cable connection is extra. Store and restaurant appear larger on website than they actually are. Pool area is small and they sell pool memberships to local residents. Grass sites are close together and are not Class A friendly. We will not be back! Rustic cabins, fully furnished 1 or 2 bedroom park models and deluxe park model suites for rent. Free WiFi, pool, Coyote Grill, store, 3-hole golf. Daily, weekly & monthly rates. Special summer discounts.